Redefine your footwear collection by opting for this stylish pair of flat sandals from the house of Truffle Collection. It has a soft foot bed, which will keep your feet at ease throughout the day, while the slip on fastening makes it pretty convenient to wear. 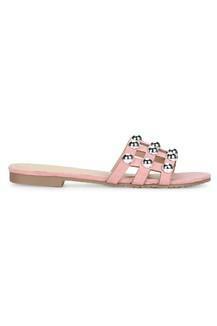 Look classy when you wear this pair of flat sandals with any of your favourite outfits. It will look great with any pair of jeans along with a cool top.